Autumn is upon us the nights are drawing in and there's a real chill in the air. We are coming ever closer to the Christmas season and our thoughts are turning to preparations for the festive season. Knitting group is up and running again at Joyces' house third Monday in the month 2-4pm. Dont forget the next group meeting is at Farnsfield village hall Wednesday25th October. This is an open meeting bring friends family neighbours everyone welcome to join us. Regretfully this was not well attended and only 1 guest joined us however we enjoyed the evening with an interesting talk by Anne Featherstone talking about fairs their history and where they were and still are held. This is an event for and arranged by Hebdon Bridge WI using 2 venues selling fabric/craft/haberdashery/wool related. This was held at Rainworth village hall the speaker was Colin Bower and a light supper was provided. This year we are returning to Shugborough Hall former home of Patrick Litchfield cousin of the Queen. It is now owned by the National Trust and after extensive refurbishment is once again open to the public. What an entertaining and fun evening we had everyone joined in. The competition between teams was serious!! There wasn't a sweeping brush or gram of ice to be seen but it was an evening we all enjoyed look out for the fixture next year! 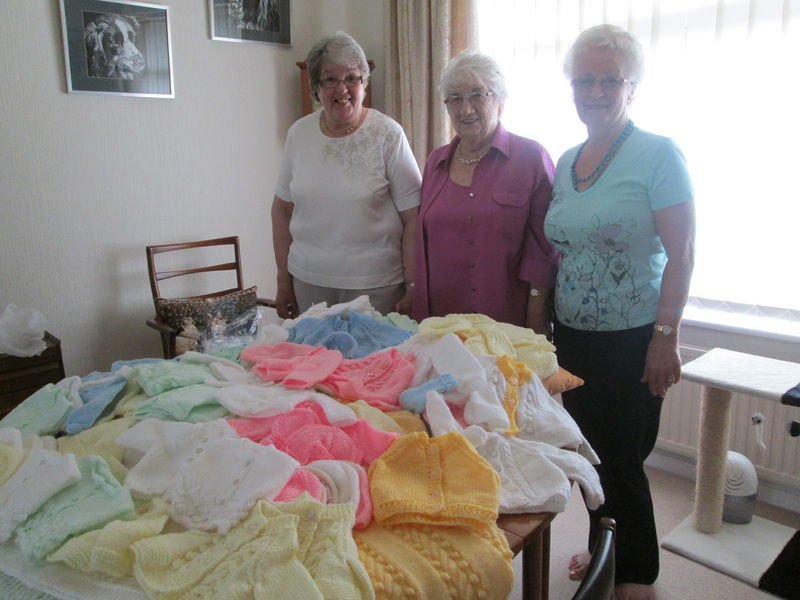 Brenda took 2 large bags of knitteds to the neo natal unit which they were very grateful for. They require blankets 24ins square any knitters out there please help. We are still looking for anyone who would like to join the group either to come to the monthly 'meetings' at Joyces' house or to knit at home. A very interesting talk by Claire Lyons on her patchwork journey. How her love of patchwork started at a young age where her fabrics came from and the stories behind her quilts. Tuesday 9th August 2016 - Tonight's meeting was all about back talk. Yunju Lee from Health on Hand in Mansfield gave us a very enlightening talk. This was followed by our usual cuppa/biscuit, raffle and general chit chat. Meeting held on Tuesday 12th July was a very interesting environmental talk given by Linda Davey. We all learnt that even the most untidy garden is doing good. Tennis at Nottingham was enjoyed by Judith, Sue and Trish. We had a wonderful day out, with fabulous weather. Also Liz enjoyed her day at the cricket too. Oh what a lovely time we all had getting dressed up in our finery for the strawberry tea and our Queen's 90th birthday celebrations. Our trips organiser Judith arranged afternoon tea at Hollybeck Nurseries,Oxton which was enjoyed by around 20 or so ladies. This was preceded by a leisurely walk around the nursery to enable ladies to look and purchase. A very enjoyable afternoon was had by all. A very interesting talk about Irena Gut a polish girl and her involvement with Russian and German forces during WW2 and the help she gave to the Jewish community in the ghetto and her later life in America. Her biography is available and I am sure will make very interesting reading. An entertaining evening speaker a social historian and her interest in 'graveyards'! Not as gruesome and morbid as it sounds she was really interesting funny and gave us all a most amusing insight into the writings on old gravestones which would no longer be allowed by the powers that be now. ​We still need knitters either to join us for a couple of hours once a month or if you can't make it to Joyce,s house knit at home. We are grateful for anything you do. We still knit for the neonatal ward at Kings Mill Hospital and a letter of thanks was received from the grateful parents and staff also a Christmas card from the ward. ​We always welcome new knitters!! We have received a letter from the neonatal unit thanking us for all the items we sent. We have another large bag of knitted items to take to the neo natal unit at Kingsmill including 12 blankets, 9 coats, 8 coat and hat sets, 8 body warmers and assorted hats and bootees. Thank you to the knitters all items are appreciated. Next meeting Monday February 15th at Joyce Godreys house 2-4 pm. If any one wants to come along you will be very welcome just contact by message or telephone for more information. We sent to the neo-natal ward at Kings Mill hospital a wonderful array of knitted items of which they were most appreciative and thanked us for all the hard work. 4 waistcoats and a selection of other items - including bootees & mittens. Keep knitting ladies they want more!! If anyone wants to join us we meet at Joyce's house 3rd Monday in the month 2 - 4pm. s part of the WI Centenary celebrations Nottinghamshire Federation held a Flower and craft festival at the home of Byron the romantic poet, Newstead Abbey. 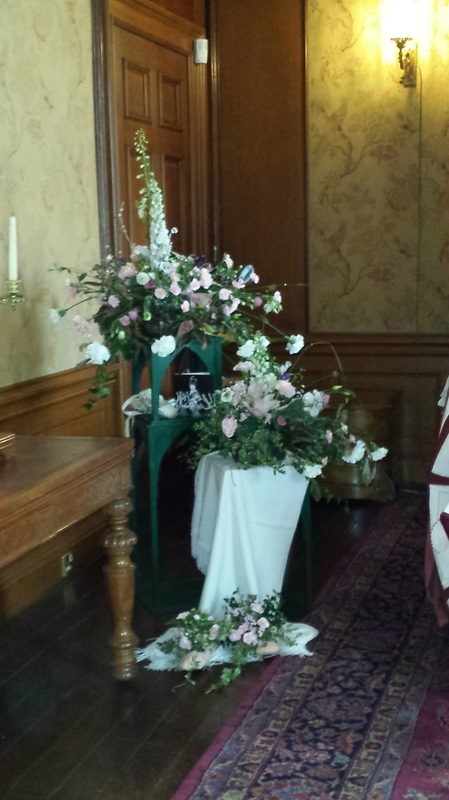 WIs around the county were invited to represent an inspiring woman with a floral display. A big thank you to Anne, Pauline and Hazel for creating our beautiful arrangement which was displayed in one of the bedrooms. See the gallery for more photographs. A buffet tea was provided and we were entertained by Over the Edge Theatre Group two ladies who gave a light-hearted look at life and made us all laugh throughout their performance. The entertainment was followed by a raffle. Change this photo to one of your pennant! 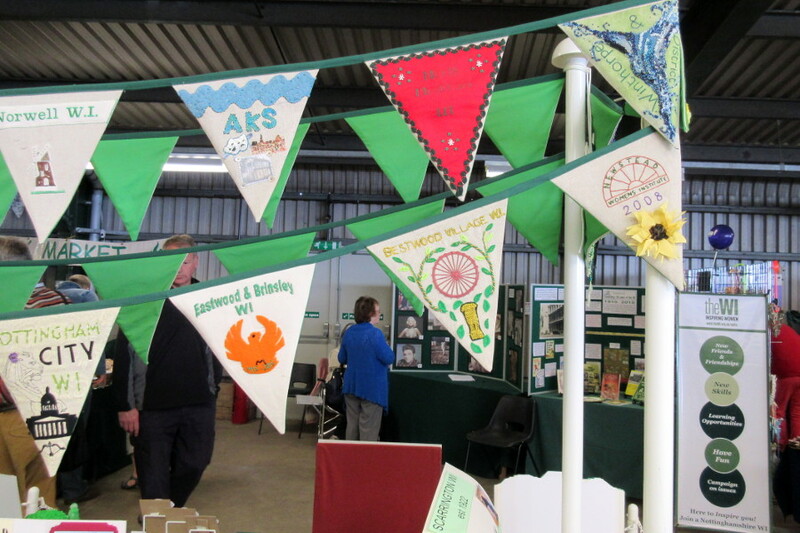 ﻿Several of our members went to Newark Agricultural Show at the weekend to see our pennant flying proudly alongside all the others from WIs around the county. There were also displays entered by 28 WIs depicting their WI or village which were judged, not by WI experts but, by the public. or check out their personal phone numbers in the year book. Michelle Jaafar is the Groups co-ordinator.